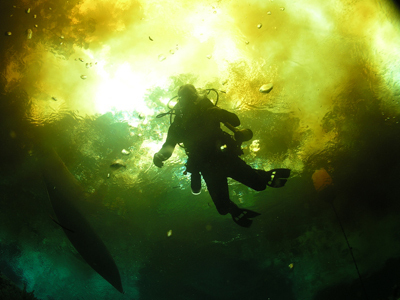 If a diver can only do one spring system, it should be Ginnie Springs. 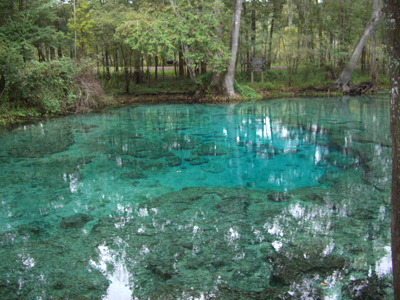 There are 4 diveable springs at Ginnie, each offering a different experience. There is the cavern with the big ballroom at Ginnie Spring, the namesake spring for the area. About 1/4 mile away on the same property is the sequence of springs named Little Devil, Devil’s Eye, and Devil’s Ear. Divers can test all the aspects of overhead environment, but take it at their own pace. Year round water temperature is 72F. Ginnie Springs is also a full service campground, picnic area, and water sports center, offering canoeing and snorkeling in the springs and the nearby Sante Fe River. I recommend starting with a dive into the Ginnie Spring Basin and Ballroom, dedicating a tank to it, then doing a second dive in the 3 Devil Springs, using a fresh tank, even though your first tank may not be empty. Little Devil, Devil’s Eye, and Devil’s Ear can all be done on one tank, and since they’re a quarter mile away from Ginnie Spring, it’s a good time to change over. Described by Jacques Cousteau as the clearest water in the world, the basin of Ginnie Springs offers an excellent place to feed the dozens of fish or hone underwater photography skills. The basin is about 18′ deep at the entrance to the cavern, the main feature of this spring. To the right and below are the two entrances to the big cavern known as the Ballroom. The huge ballroom at Ginnie Springs is an excellent place for the open water diver to experience overhead environment. It’s clear, spacious, not too deep, and the current is minimal except at the grill blocking the entrance to the cave system beyond. 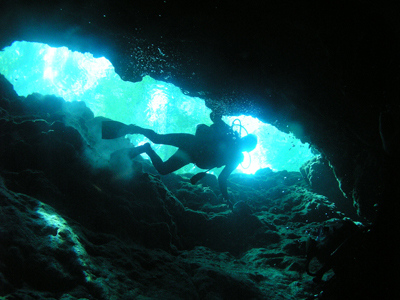 Bring a dive light. 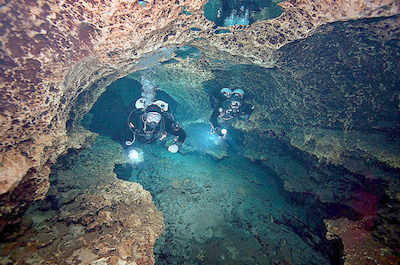 This is the only spring in the Ginnie system where OW divers may carry a light, and you will need one to explore the many crevices in the big room. There are a lot of nooks to peer into, and prehistoric shark’s teeth are found from time to time. Watch air use, as there’s no direct ascent with this overhead. 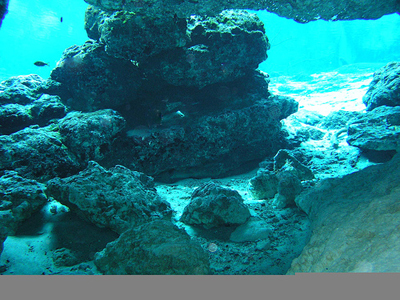 Enter through the large opening on the left and keep right, crossing the rock ledge to where the floor slopes steeply down to a sand bottom. Spot the grill below, at a depth of 57 feet. There will be a swift current flowing out of it, so check it out. Moving aside from the flow is easy, and the room extends a long way to the left. Be sure to remember to start the exit when 1/3 your air supply is gone. From the bottom of Little Devil Spring, views of clear water and trees overhead make this the photo opportunity spring of choice. A long narrow fissure in the rock drops 42 feet to a small cave opening on the upstream end. The edges are easily silted, as shown by the diver in the photo, so drop slowly, stay off the edges and avoid finning. The current is barely noticeable, but if you listen carefully, you can hear the low groan of it running through the rock below. Select a not too busy day with no wind or divers to mar the surface, move well down into the fissure opening, select a wide angle lens, and shoot the photo of the trees overhead that’s covered thousands of books. Swim down the shallow run with the current to Devil’s Eye, a small round basin about 18′ deep. The right side of this cavern leads to another cavern just below the warning sign, called the Devil’s Dungeon. Take care entering the dungeon as it’s low overhead and a real tank banger. At the lower end of the Dungeon is one of the exits of the cave system. The system begins over a mile back up under the Sante Fe River, and emerges at both Devils’ Ear Spring, further out in the Sante Fe River, and here at Devil’s Eye. Spot the orange float ball on the surface several dozen feet further down the run from Devil’s Eye, at the edge of the Sante Fe River. Swim to it, and down into the Devil’s Ear Spring. There’s a log down about 15 feet, and below that is the cavern entrance. Be prepared! The already strong flow is amplified by the narrow vortex opening. Regulators may free flow, and masks can move around to your ear. This will be an introduction to the currents that can be found at restrictions in any cave system. Pay attention to divers who may be exiting, pull past the restriction, and out of the flow. The cave warning sign appears at 45 foot depth, the place where non cave divers must turn back. When exiting, take care as the current will push you rapidly out, into any divers entering, or into the log. As mentioned earlier, a visit to the 4 springs at Ginnie will expose the open water diver to the components of the overhead environment, including big ballrooms, clear water, silt, and current. It’s a good day of diving. Cost to Dive all day is only $30! !